Single Roofing benefits, are you considering an asphalt composition shingle roofing system for your home? If so, this is the place to get positive reinforcement for your decision. However, keep in mind one important fact about the solution – it’s only as good as its installer. This roofing is a complete waste of money if it’s poorly installed by an inexperienced crew. 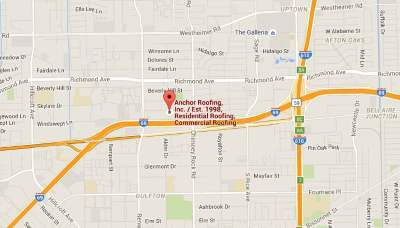 But you need not worry, because with Anchor roofing contractors Houston your roof is in good hands. Asphalt shingles are available in a series of colors to complement the style and color scheme of your home. However, your roof appearance options don’t end there. You can choose asphalt roofing that mimics slate or cedar or sequoia wood roofing. And yet there are a plethora of other options. Reliable, sturdy, enduring asphalt roofs are also leak-resistant when properly installed, and they can last up to 30 years or more. Longevity is helped by ideal weight; asphalt is neither too light (which means less chance of uplift problems), nor too heavy (so requires no reinforcement). Asphalt shingle roofs are resistant to fire (when installed with fiberglass matting) and wind, typically staying put in the roughest of weather. The compound of asphalt shingles in a comprehensive roofing system offers sound protection from outdoor noise. So, when you include asphalt in your roofing system, the shingles can greatly reduce noises, because your home deserves the peace. Your asphalt shingle roof can be unique, and look completely different from your neighbor due to the wide choice of asphalt shingle shapes. You can choose a neat, flat, uniform look (done with long, rectangular, asphalt shingles in a flat, edge-to-edge configuration). More often, you’ll see overlapping asphalt shingles that are relatively uniform in shape and color, but appear different shades because of the 3D overlapped effect. Natural-looking, rough-edged shingles are also an option. Asphalt roofing systems are very cost-effective for homeowners, offering excellent value for the money. The best roofing contractors in Houston also offer accurate, up-front pricing and payment options, including financing. Your roof must be sturdy and durable to ensure that you are getting the maximum protection. Every homeowner needs to decide the apt roofing material their roof needs to ensure that their shelter is secure. Home owners also need a good budget plan to know how much they can allocate, as materials such as metal and cedar fall into the premier category and are expensive with higher installation cost too. There are many reasons to opt for asphalt shingles roofing, but the main being lower costs. Remember to consult with professional roofing contractors and choose your roofing solution wisely. There really are a lot of benefits to shingle roofing that many homeowners do not take into consideration. I particularly like that the article goes over the fact that they are highly durable. After all, a good, solid asphalt shingle roof is not going to be letting any rainwater into your home anytime soon.